Using the functions in text module one can place and edit labels on the graphics screen. The labels can be saved for a later reuse, adopted in the vector graphic or exported in various formats. You can generate labels with up to 900 lines which respectively hold up to 100 characters. Should there still be data of the last work in the program, then save this using File . save or Save under. After this, delete all data memory using File . New. Set your work limits in Layout . Limits to the desired label size. Example: dimensions of X=150mm x Y=100mm. The input of the limits is designed to be universal. I.e. the reference point of the processing (zero point) can be arranged anyway you like. Set inputs for work limits installed. Work limits bottom left(0) to top right(1). The input of the work limits referred to the selection of the zero point (right, next to the input). With zero point selection (9 points in the frame), only values for width dx and height dy are entered. 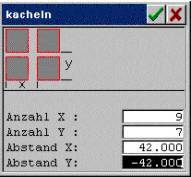 With zero point selection outside the frames, all values for bottom left to top right are expected. With ‘YES’ the (label) border is displayed. A border, which is used for the text layout, can be matched to the work limits. Positive border values: relative border in % for labels (recommended setting). Negative border values: absolute border in mm. Adjust the working limits (frame) to the existing graphic. Centre the graphic in the frame. Centre the frame and graphic at the zero point. Displace the graphic in the actLayer manually. Here a manual nesting is also possible (arrange the milling object layer-oriented for the waste optimisation. -The frame is dashed and the paths are drawn here as continuous (up to max. 20000 dots.) Objects (milling paths in the layer) are rotated using by +/-30°. Texts are not rotated here. Use of layer and milling tools. The program processes layers, i.e. with various work limits. All layers are of equal value. An operation can be input in any one desired layer or in several layers. Number of lines of text. 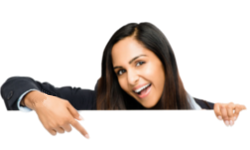 By clicking-on the marking element alongside the layer indicator, the graphic can be switched for this layer to co-mark ‘inactive (=white) or ‘active’ (=layer colour). Initially, leave the layer active. For all engraving processes you require at least one milling tool. For simple recessed engravings without milling offset calculation you can work using layer tools. Layer tools are the first 50 tools of the tool library. These are allocated to the layers. I.e. Tool #0 is used with layer #0, Tool #1 with layer #1 etc. The management of the complete tool library takes place in the menu Extras using Tool input.
. A complete description of the tool input can be obtained in the General Instructions CAD under Tool input. You access text input using Text . edit Line. Input line (top, white background) with the entered text and control symbols for the current text line. Aid (graphic settings, parameter, help, layer selection etc.). Graphic area with text line and, possibly, graphic. Menu for the text parameter selection. All settings for the text line are carried out here. Enter the start position of the first line using the cursor in the work area top, centre – a precise positioning now still not necessary. Set the Font: G4200312, height: 5.000mm and mode:bottom, centred (see picture). Enter the text. Using Adjustment . Height + Width the text is adjusted within the inner frame. With this, the engraving is entered completely. Now switch to CAD, using back..
. You obtain a plan view of the wide milling trace. For this aid a correct input of the tool is required. Export your milling data using File . direct mill. The first export should always take place via direct mill. All further exports can also take place via the aid direct mill Auto (Auto Export). Auto Export always uses the export path last employed. As, currently, there is no other data in the layers, the unused layers must not be switched OFF for export. Therefore, acknowledge the window using Export. The program then opens the export menu. Here you can select an export filter. Now select DIN/ISO, the desired export filter and OK.
You can view the saved ISO data using the text editor. For this, switch back to CAD. Here, select Extras . TextEdit. Select the previously created file and open the file with OK or a double-click. Supplementary information for label input. Control characters for the text input. Control characters can be employed in the test line (text effects). Text effects are always set for the current label only. If another label is loaded, then the text effects therein are also loaded. If the label is deleted using New or using Delete Text, the text effects are set to the initial status. Values for the drawing modifications can be set under Input parameter . TextEffect. <Alt Z>: Serial number On/OFF. <Alt X>: Character spacing to the right. <Alt Y>: Character spacing to the left. <Alt G>: Present all following lines larger. <Alt K>: Present all following lines smaller. <Alt H>: Place all following characters higher related to the baseline. <Alt T>: Place all following characters lower related to the baseline. <Alt V>: Distort all following characters in their width. <Alt N>: All following characters are inclined by the specified angle. <Alt S>: All following characters are blocked. <Alt P>: Following characters are arranged on an inclined baseline. <Alt E>: Change into Editor. Setting block: only using act. block. line: with all lines. <Ctrl Posn1>: Text input into 1st text line. <Ctrl End>: Text input into last text line. <Ctrl Y>: Delete text line. A serial number is introduced using <Alt Z> and ended. In each text line respectively only one serial number is permitted. With every export (direct mill or Export Graphic) the serial numbers are incremented or decremented by the amount given in the parameter Input parameter . TextEffect. Inc Serial Number +/-99999:. The input of leading zeros in the serial number is allowed. An overrun of numbers (limiting value) is not checked. Text input into the editor . Using the Windows Editor, both the external text files can be read-in and also texts can be adopted via the clipboard. If texts have been read-in via the file menu of the editor, then these must be saved for adoption in the file ‘HS05.TMP’. The file ‘HS05.TMP’ can be found in the main directory of the milling/engraving program (e.g. eSIGN2D). The text input into the editor is dependent on the input setting Block / Line. Setting Line: All text lines are adopted and can be processed. In the text lines input select the correct setting Block (adopt only text for the current block) or line (adopt text for all lines) and the desired text line. In the text input, select <Alt E>. Should the editor not be started, then you find yourself in menu selection. In this case activate the text line input by clicking-on the text line. Transfer the marked text from the clipboard into the text editor. End text editor. Acknowledge the inquiry ‘Store current change’ (in ‘HS05.TMP’) with ‘YES’. As far as no other file name has been entered in the editor, the file ‘HS05.TMP’ remains preset and must not be input again. Selection of special characters . In text lines input you can open the character selection using <F5>. By simply clicking on a character with the cursor any listed character can be selected. The width of the space character (Space) can be set using Input parameter . TextEffect . Word separation (Space). With 100%, the separations from the character set are used. Values > 100% increase the word separation. Clicking-on a new text line using the cursor. During the text input into the Menu edit, existing text lines can be clicked-on or new text lines can be created in free positions. If, with clicking-on, no existing text line can be found, then the cursor is set on the clicked-on position and the program waits for the input of an absolute line reference position (as with the input of the 1st text line). Only character sets, which are listed in the dialogue box, can be selected. To select the file click-on the file name. A double click or OK starts the loading process. By clicking only once a selection of characters is shown in the graphics window. F..: Outline fonts for free spaces. The list of character lists can be installed using installed HZE optionally according to file name or the recorded font name. 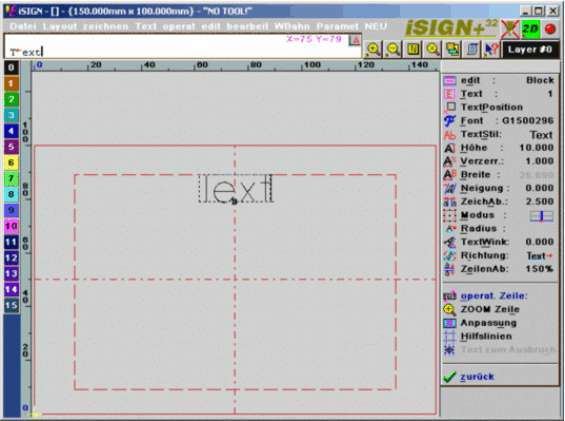 Select text input in CAD. Using Text from file both external ASCII text files can be read-in and text can also be transferred via the clipboard. If texts have been read-in via the file menu of the editor, then these must be saved for adoption in the file ‘HS05.TMP’. The file ‘HS05.TMP’ can be found in the program directory. Functions in text from file. Deletes all existing text lines (text + line parameters). Delete only the text but not the line parameters (text settings). The texts are replaced by a SPACE. With this, the text lines are retained and can again be filled with new text later. The text lines are filled with the texts of an ASCII/ANSI file. The line parameter (i.e. the text arrangements) remain unchanged. Text line, for which no texts are available in the file, are filled using SPACE are thus retained. 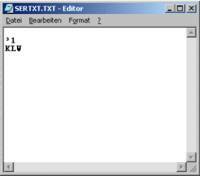 An ASCII/ANSI text file is loaded and bound to the existing texts. Available texts are shown in Windows Editor. These texts can be edited, texts can be read in, texts can be transferred from the clipboard etc. Before leaving the text editor, the texts must be saved in the file ‘HS05.TMP’. Text from file . delete text. Text from file . edit text. Insert the text from the Windows clipboard into the editor using and end the text editor. Confirm the inquiry ‘Save current change’ (in ‘HS05.TMP’) using ‘YES’. So far as no other file name is entered in the editor, the file ‘HS05.TMP’ remains preset and must not beinput again. Text from file . replace texts. Text lists Each label receives own text and, possibly, a serial number. Text matrix The labels receive the same text, text variables and serial numbers. Text lines are created using the module, which can be modified in the text module and, as before, can be further processed. Max. 10 text lines in one block. In total max. 4000 text lines. Permitted are straight text lines only (radius = 0, slope = 0). Should data of the last tasks still be in the program, then save these using File . Save or Save under. After this delete all the data memory using File . New. Set you work area in Layout . Limits to the desired material dimensions. As opposed to the simple label here the material dimensions (complete work dimensions) are entered. Example: dimensions of X=300mm x Y=200mm. A description of the work limits can be found under Label input . Work limits (label dimensions). The program processes layers, i.e. using various work areas. All layers are of the same value. 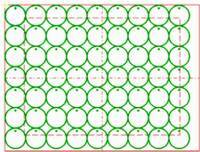 A detailed description of the layer selection can be obtained under Label input . Use of the layer and milling tools. Using the series label module several small labels are created on a larger plate within the (work limits). Input of the label data. 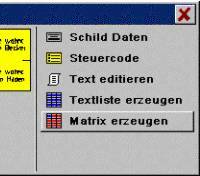 Text input and, before, possible adjustment of the control code. Create text list or matrix . The text input takes place via an editor. Using series label text lines are created, which can still be modified or further processed. Input are the text lines per block specified in label data. Empty text lines are omitted on the label, alternatively, using ‘.p’ at the start of the line, it can be switched further to the next block. The series label module always collects the data for the labels from the file SERTXT.TXT. If you open the editor this file is loaded automatically in the text editor. If texts are adopted in the editor from a file, then you must save these for the series label module in the file SERTXT.TXT. For the transfer of data choose File selection . save under [program directory ]SERTXT.TXT. Serial numbers are added using the value set in Input parameter . TextEffect . Inc Serial Number. Block width/height: Dimensions of the individual label. The dimensions must be selected clearly smaller than the work limits. 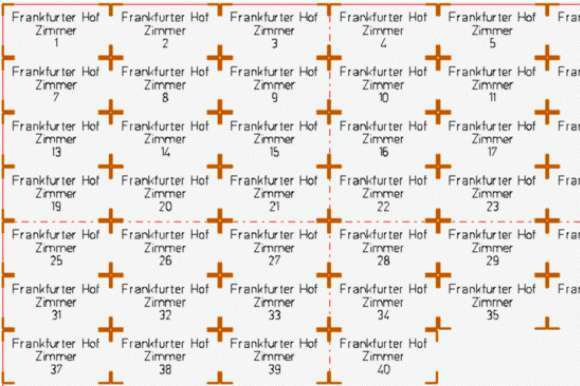 Frame separation X/Y: Possible additional separation of the individual label, e.g. separation to cutout. 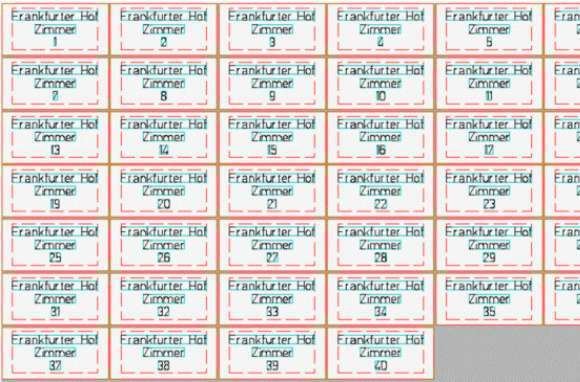 Border left/bottom/ right/top: Border, which should not be exceeded by the text..
Block number: Number of labels which are to be created on one plate. Max. block line number: Max. number of text lines per individual label (max. 10 lines). Mill label border: Optional setting for the simultaneous cutting out of the labels. The cutting out can take place using an own tool. 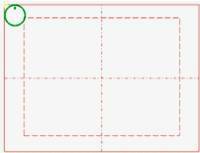 In any case the cutout movements should be saved in an own layer (Border tool #). The layer should follow the engraving layer (# milling layer > # engraving layer). Border tool #: Selection of the cutting-out tool if Mill label border has been activated. 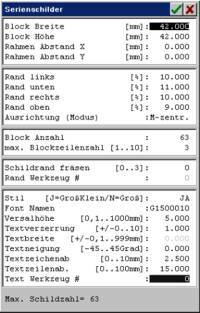 text tool #: Text settings. The same settings are used for all texts. With the input of label data the maximum creatable labels with are displayed using Max. label number = .. Match the control code ‘³ ‘ and ‘%~ ‘ to the country-specific editors. Under Windows, depending on the language installed, the proposed control coded is not usable. For this case an own code can be established. Activation of a text editor for input of the label texts. Punctual orders are possible in the text list. These orders start with a dot ‘.’ at the first position in the line. Lines with point orders are not engraved. .. (Commentary) These lines serve as remark. .p (Block separation) A new label begins following this marking. ³ = Serial number – can be used both for test lists and also for a matrix. ~ = Text variable – only for matrix. The texts are entered consecutively. So far as no block separation ‘.p’ is present, all text lines to max. block line number are adopted in one block. Empty spaces are also counted but are nor engraved. If an empty line is to be output, then this line is to be input using SPACE (‘ ‘). A serial number can be entered into the text. The serial number is initialised and ended using the key combination (³). For text list and matrix only one serial number is permitted. The serial number is incremented with each new block (label). A serial number can be specified both formatted and unformatted. The unformatted input is characterised through (³) possibly followed by a start number (e.g. ³1). If the start number is not indicated (e.g. only ³), then the serial number begins with ‘1‘. If further numbers follow the start number, which may not be incremented, then the serial number is limited by (³) (e.g. ³1³456). The serial number in the series label is incremented using Input parameter . TextEffect . Inc Serial Number. Use text variable for matrix. The character (~) is the place holder for the variable text. The variable texts follow immediately after the pre-defined frame text – for each entry one text line. Using the Windows editor both external text files can be read-in and also texts can be taken over via the clipboard. If texts have been read-in via the file menu of the editor, then these must be saved for adoption in the file ‘SERTXT.TXT’. The file‘SERTXT.TXT’ can be found in the main directory of the program. Activate the program from which you wish to take over the text. Mark the text and adopt this in the Windows clipboard. Select Series label . Edit text. Take over the marked text from the clipboard into the text editor. End the text editor. Acknowledge the inquiry ‘Save current change’ (in ‘SERTXT.TXT’) with ‘YES’. So far as no other file name has been entered in the editor, the file ‘SERTXT.TXT’remains preset and must not be input again. Each label receives own text and, possibly, a serial number <AltGr 3> (³). Create labels using text lists. For labels with text lists, the complete text lists for all blocks beforehand. Then the texts are taken over up to max. number of lines in the blocks. Lines not used can be switched OFF as empty spaces or blocks limited using ‘.p’. A serial number can be defined at any position and incremented using a further marking (³). The labels receive the same text, text variables <AltGr +> (~) and serial numbers <AltGr 3> (³). For a label matrix the frame text and the variable texts are to be entered completely beforehand. A serial number (³) and/or a text variable (~) can be defined in the frame text. Example for a text matrix. Work limits (material parameters): dimensions of X=300mm x Y=200mm. 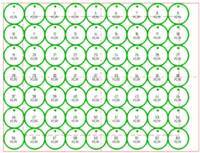 Label data for 48 labels, each 49mm x 24mm. Display of 3 text lines in the editor. Because the text line Frankfurter Hof is too long for the settings made, there is first a warning from the program. You can ignore the warning (tolerate overstepping) or correct the overstepping e.g. automatically. check the data. You obtain a plan view of the wide milling trace. For this aid a correct input of the tool is required. Result of the milling data display. Export your milling data using File . direct mill. The first export should always take place via direct mill. All further exports can also take place via the aid direct mill Auto . Auto Export. Auto export always uses the export path last employed. Series label – matrix for circular badges. Layer line . tile: make multiple copies of badge. All borders of the badges. Inputs in the text editor. Alls badges with text Task. From a plate 400mm x 300mm circular badges Ø 40mm with a drilled hole Ø 4mm are to be milled out. The badges are to receive a serial number and the constant text ‘KLW’. If the should still be data from the last task in the program then save these using Save . File or Save under. After this delete all data memory using File . New. Adjust your work area in Layout . Limits with dimensions of X=400mm x Y=300mm, zero point top left. Select Layer #2 as ActLayer and draw a badge at the point X=0 and Y=0 (top left). The graphic must be corrected by the cutter radius (here CuT = 1.0mm). Make multiple copies of the badge using Layout . Layout . Layer line . tile. CuT = 1.0mm; CAn = 0; FrK = 0. Spd = 30000; TSt = 2. Select Layer #0 as ActLayer for the engraving. CuT= 0.15mm; CAn = 20; FrK = 0. Select Text . Series label . Label data and input data as per diagram. Select Series label . Edit text and input following text. 1st line The 1st text line contains only one space (as placeholder). 2nd line The 2nd txt line contains the Serial number (Badge ‘³‘) starting with 1. 3rd line The 3rd text line contains the fixed text(‘KLW’). End the text editor. Acknowledge the inquiry adopt modified text with YES. Note: In general the target file is preset. If the file name has been converted, for example through File . open, then save the data in the file SERTXT.TXT. Select Series label . Create matrix and the text alignment is displayed. After Graphic Norm you receive the complete engraving view with the previously created badges. Export you milling data using File . direct mill. Layer #0 (engraving) and Layer #1 (milling out) must be exported for the complete task.